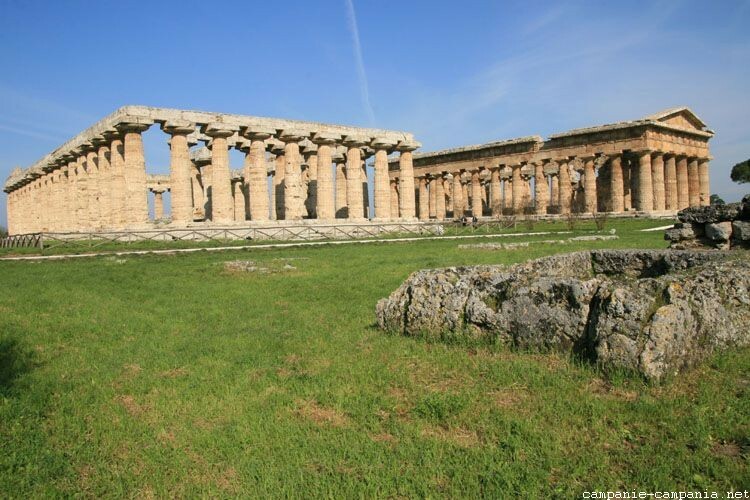 Paestum, called Poseidonia at the time of Magna Graecia, was founded in the 6th century BC Its remains are located in the province of Salerno in Campania, 3 km from the Tyrrhenian Sea, in the plain of Sele . It is an important archaeological site. Its 4.75 km long wall, its three Doric and Ionic temples, as well as its museum, make it the most remarkable architectural ensemble of Magna Graecia. In 1998, UNESCO inscribed the site as World Heritage of Humanity. 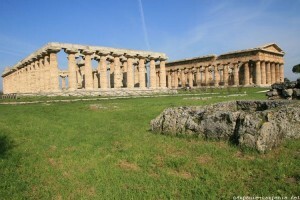 Paestum is officially located in the Cilento and Val di Diano National Park, although in geographical withdrawal. 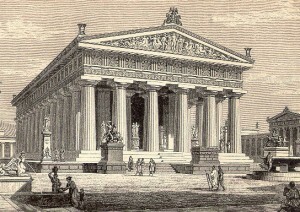 The site includes buildings from Greek and Roman times, including the three great Greek temples (two Doric and one Dorico-Ionic), as well as a bouleuterion, a small Roman amphitheater, a comitium and a heroon (a small funerary temple dedicated to the founding heroes of the city), without omitting the Roman gates. The contemporary city of Paestum is south of the archaeological site, it is a popular seaside resort, on a coastline with long sandy beaches. The oldest remains of the city are tombs, northwest and northeast of the city, and the sanctuary of Hera, a few kilometers north, at the mouth of the Sele river. It was around 600 BC that Greeks from Sybaris founded the city named Poseidonia, from the name of Poseidon, the god of the sea.